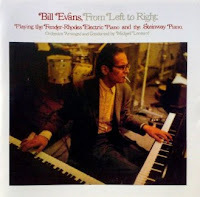 It comes to my mind Bill Evan’s rendering of “The Dolphin”, by Brazilian pianist Luiz Eça. Released in his “From Left to Right” album, in 1970, it became the quintessential performance of that song. As far as I know, there isn’t any other comparable interpretation of it. Both “before” and “after” versions are the epitomes of what can be called “inspiration”! Just to give an example: In 1921, Arnold Schoenberg devised a twelve-tone technique which was named “dodecaphony” and was adopted by some of his countryman composers for the next 20 years. (By the way, his creation inspired the same Bill Evans, many years later, to compose a song named “TTT”, or “Twelve Tone Tune”). Before Schoenberg discovery, there was something named “nondodecaphonic serial composition” which was used, among others, by Alexander Scriabin, etc. Then, Ask I: Do these creations (or discoveries) guarantee any sort of superiority when used in a musical composition if the intent is to please the listeners; to display beauty; to inflict emotions? Should music be, first and foremost, a kind of competitive stuff in which composers strive to achieve the highest step in some gender of competitive ladder or should it be intended to communicate as wide as possible with all sort of listeners? Of course some composers are naturally sophisticated and their pride and taste will prevent them from producing anything easily assimilated by the people in general. But it is a choice of them and they know their work will not be understood by many. But they want it to be like this. So, Mr. Jason Marsalis is right on the target: music is primarily a task of inspiration and good taste; irrespective of which path its composer decided to follow.